I’m Bob Osmun. I started Osmun Music in 1976 in a Cambridge loft I shared with a couple of flutemakers. I had been a horn major at New England Conservatory and while I was there, two things happened to me: One, I realized that I was not going to become a professional hornplayer and, Two, I met the Boston repair legend, Bill Tottle. Bill’s shop was located in the Musician’s Union Building, at the other end of St. Botolph St. from the conservatory. It was a rather dingy basement with a couple of dirty windows to let in the light. A counter divided the workshop area from a waiting area decorated with a couple of pictures and a bunch of display cabinets, empty except for a pair of F. Besson C trumpets that had been there since before anyone could remember. Bill did most of his work in the front drawer of his old wooden office desk, which he kept pulled out about six or eight inches. The rest of the desk was piled high with everything under the sun. 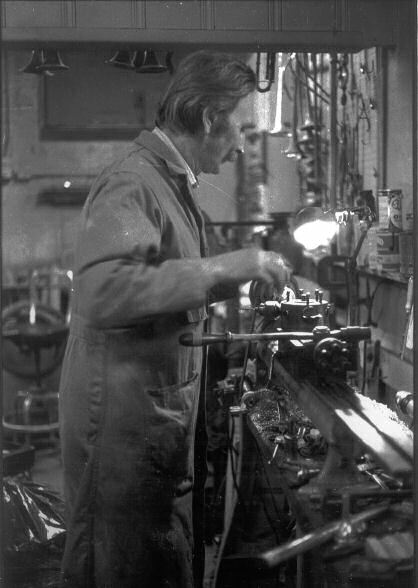 He had a workbench in back (by the window) and an old Stark jeweler’s lathe ( no power feeds, no threading, etc.). A buffing lathe was against the far wall (No separate room, no dust collector). A sink in the corner next to a plating rectifier and an enormous stoneware crock full of chromic acid (now frowned upon by the EPA, MWRA, and OSHA, among others) completed the space. The attraction of going down to see Bill Tottle was more than the wonderful and weird space or his amazing prowess as a repairman. He was one of the funniest people I’ve ever met. He loved to tell stories and he had about a million of them. In addition to being a repairman he had been a trumpet player at the height of the big band era. His father had been a trumpet maker (Vega) and they had owned a large music store in downtown Boston. Bill had played everywhere in the area, from Mosely’s on the Charles, to The Stable, to Salem Willows. He used to tell me that he had “coast-to-coast reputation; from Nantasket to Lynn Beach”. I arrived at NEC in the fall of 1965. Though I didn’t know it, I had arrived at NEC woefully unprepared. I had had no ear training, no piano, no theory, no transposition, and my only orchestral playing experience was one concert as a sub in New Jersey All-State. As a conservatory student, I was less than a success. As my academic career foundered I took to spending my afternoons hanging around Tottle’s shop, listening to his tales of the big band world and his endless collection of “bon mots” and “wry quips”. Eventually, he offered me the job of sweeping the floor on Saturday mornings (at the rate of $5 a week). I have a TOTTLE mouthpiece for trombone. Please let me know Bill’s shop’s Address. Bill made very few trombone mouthpieces. After Bill Tottle died his business was taken over by his nephew, Bill Mazzoca. It was later sold to Lou d’Orio in Providence. That business has been gone for many years and I have no idea what happened to the tooling. Bill’s mouthpiece is very wonderful and excellent. I am lucky. I live in Tokyo in Japan. Where was Bill’s old shop. I would like to know his shop’s place.